Proving once again that I totally can’t manage the concept of ‘wordless’ … let me explain this image a bit. I have been talking since last year about wanting to run an Ultra – and frankly with the mileage I do, it shouldn’t be an insurmountable challenge. Last year washed out because of too much work travel … so I looked to this year, and found the Finger Lake Fifties. On one of my Facebook groups I saw the sign-up date, looked at the Finger Lake Fifties page when the date came – and took a couple of days to see if the schedule would allow. At the time we were looking at a vacation a bit later in the month and what is fast becoming an annual weekend with some friends who have a place in the Poconos was also later in the month. So I signed up … or rather I TRIED to sign up, and ended up on the wait list. Ugh. OK, so I contacted the race coordinator – who was on the same Finger Lakes Running mailing list as me – and he said that there are two drop points in February and March, so by the beginning of April I would know if I had a shot. Yeah, and so February and March and April came and went without me hearing anything, and while I kept the race in my head, I had given up actual hope and started looking elsewhere. Also between February and March one set of friends needed to shift the date of the meet-up, and because one of the primary reasons for our vacation destination of New York City was some college visits in the area … we ended up having to shift our vacation a week earlier to match with other schedules and be back for the start of Marching Band camp. 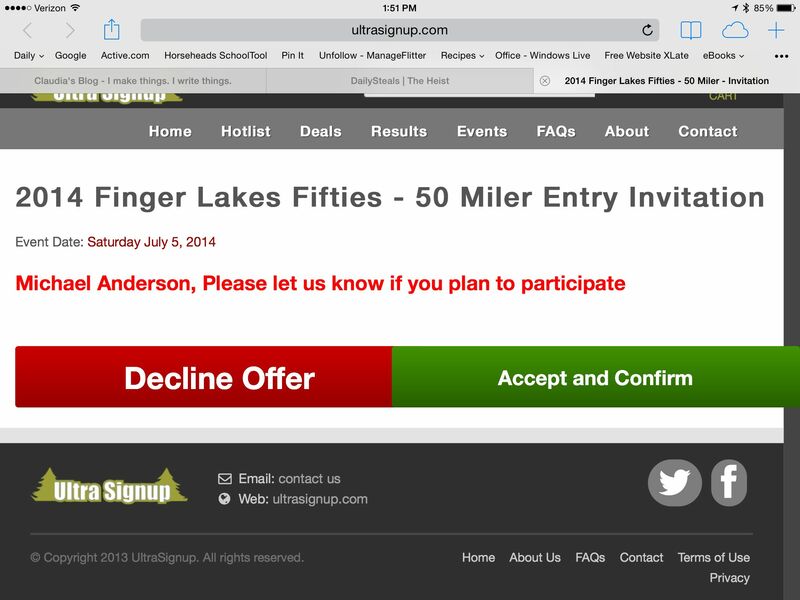 So OF COURSE this week I got an email saying that I had made it from the wait list onto the sign-ups for the Finger Lake 50s! That elation lasted for about 5 nanoseconds until I realized that the race is the day we go on vacation … and also when the second rescheduling of the Poconos weekend had landed things. So I was suddenly triple-booked, and since running a 10+ hour, 50-mile race would likely mean spending half of our vacation recovering … it was an ‘easy’ and very clear decision – but incredibly difficult to actually DO it. I actually waited more than 12 hours to click the button … because I REALLY want to do it, I really know I CAN do it – and do it well. So I was more than a little disappointed – but on the other hand I am a very patient person, and once I allowed myself a bit of time to be sad, I clicked (ok, tapped) ‘Decline’ and thought – next year I will sign up immediately. And I let my family know. So like my various marathons and half marathons … it is something on the calendar that we will do together – just in 2015 rather than 2014. Also, there are other Ultras – I am on the wait list for a couple of others including the ‘Can Lake 50’. OK, enough of that – how about some happy music? This entry was posted in Running and tagged Marathon, Running, ultra by txa1265. Bookmark the permalink. At first, I thought that you just accidentally clicked the wrong button and declined when you meant to accept. But no, only slightly better than that, you chose to decline. I think my heart broke a little after you told me that you had news coming about it. My fingers are crossed for your acceptance into one of the other 50 milers you’re waiting to hear from! And if nothing else, now you know to sign up right away! So true Beth .. and it is interesting to me that it feels like less of a big deal now that it is done. It was a hurdle, but the right choice. And ultimately not such a big deal! There will be more! Don’t make it so dramatic next time, though! Haha, I routinely spend the first several days of our vacation recovering from a race (either one that I ran a few days earlier, or last year I actually did the marathon in Berlin a few days after we started vacation). I have to say, wise choice my friend. You’ll enjoy your vacation more if you’re not sore and there are so many other ultra choices, this year or next year. Very excited you’re committed internally to doing it, whenever it may be. Can’t wait to read about it. Major bummer that the timing didn’t work for you this year. That’s the worst! I’m a little ashamed to admit that I would have tried to do both – but I’ve got ultra-running demons that I can’t beat. I just realized that the 50-miler I wanted to do in June will conflict with school (the one thing I don’t let running affect) so now I’m looking for another in June/July too! It becomes a bit of a letdown! That is the thing – we decide the boundaries of what we will and won’t compromise. And if I had a work trip the next day I would have raced … but not my family. Definitely we will have a great time on vacation … and I will absolutely be rocking more Ultras and marathons this year! I know how hard it must have been for you to decline your spot for that race, but you WILL run an ultra, I have no doubt and you will kill it!! Enjoying time on vacation with your family without having to spend a lot of time recovering will bring you a lifetime of memories. I really hope the Can Lake 50 opens up for you to run that, and if not…you will be on a starting line for a 50 in 2015!!! Thanks Sara – and reading your post yesterday I know you get my feeling that my family time is the one thing that is absolutely inviolate. And at this point I am more patient – I will be here when the stars align between races and my schedule! Oh goodness my eyes just about fell out of my head when I saw the picture and I’m so glad you didn’t go completely wordless or else I probably would have lost my mind wondering what happened! I’m so sorry about the bad timing, but I think you most definitely made the right choice and you WILL do it and when that time comes it will be the perfect race scenario for you! I’m already getting excited to hear about how it will all pan out! Haha! I couldn’t even think about leaving it unanswered … that would have been cruel! As it is the post was a bit dramatic but I was glad I wrote it because it immediately dispelled any lingering concerns. And I don’t really know how much I will like running it. I love the marathon distance, and have had friends tell me that I will really love the feel of hte ultra. Oh no! Just as I was bugging you about races, this happens. Sorry :(. But you’re right – there will ALWAYS be more races, and it sounds like you have a great line up of family fun! No way you should be sorry – I loved your comment on my Instagram! And as I mentioned, this post was very cleansing for me.